Razoid is Stoica's and Lythirus's Battle Gear. In real mode it looks much like Gigarth, both have massive claws. 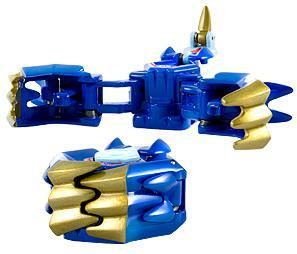 It opens up revealing two powerful mega-claws. Its red diamond glows intensely sending the enemy into a trance which allows it to eliminate its opponent with a mighty claw swipe. The claws dig under the ground for stealthy attacks. Purchase your Razoid Battle Gear from Amazon now!